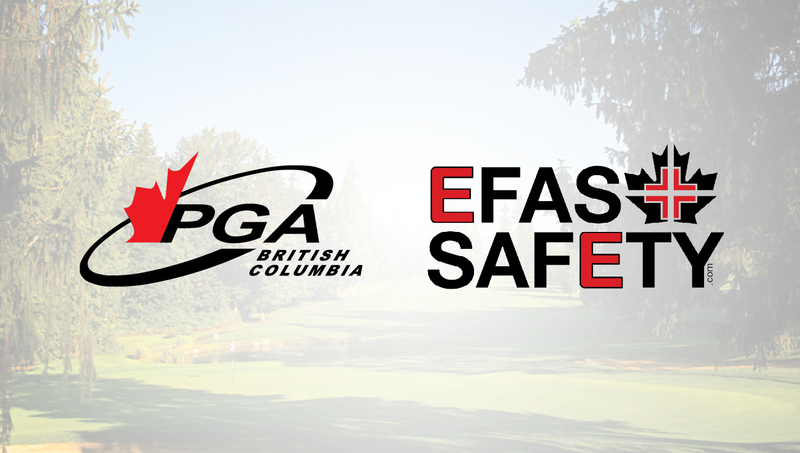 RICHMOND, BC (PGA of British Columbia) – The PGA of BC is proud to introduce EFAS Safety as the Association’s newest Preferred Partner. EFAS Safety is a Burnaby-based mobile supplier of high-quality safety equipment and first-aid products, featuring an experienced team of safety experts dedicated to keeping your place of business, patrons and employees safe and sound. This Bronze-level partnership will extend through 2021 and includes presenting sponsorship of the PGA of BC Facility of the Year Award. EFAS Safety proudly serves the Lower Mainland, Fraser Valley and Vancouver Island, delivering an array of premier safety products and equipment direct to your facility, tailored to your business. The company’s team of highly trained representatives also conducts safety audits to help your establishment meet and exceeds WCB requirements, as well as training for your employees in safety and first aid. “Safety is of paramount importance for PGA of BC facilities, and we encourage our Professionals to take advantage of the first-rate service and supplies offered by EFAS Safety with the welfare of their customers and staff in mind,” said PGA of BC Business Development Manager Grant Gray. EFAS Safety is British Columbia’s fastest growing mobile safety-supply company. Since the beginning, EFAS has been committed to making a difference in the mobile safety industry by delivering to your door high-quality first aid and safety supplies, backed by unmatched service, expertise and industry knowledge. All EFAS representatives are fully trained in all aspects of occupational health and safety, allowing us to tailor safety recommendations and equipment to match any need a business may have. Learn more at www.efassafety.com.